What were the biggest news from the Cycling Embassy of Denmark? We have had a look at what our readers liked the most in 2014. Here’s our Top 10 in case you missed them. What does it take for the Danes to cycle? Both the physical surroundings and individual conditions influence our choice of our means of transport in our daily lives. Odense City Council passed an ambitious traffic and mobility plan that is meant to markedly change the infrastructure of the city and further sustainable traffic. The Cycling Embassy of Denmark will be hosting a new Bikeable City MASTERCLASS in Copenhagen on May 26.-30. 2015. One of Denmark’s most busy train stations, Nørreport Station, has been equipped with the first of nine “bicycle beds”. After an internship with Gehl Architects, two students produced a handbook on strategies for making better urban spaces for citizens of all ages based on their experiences with the Gehl approach and the Danish bicycle culture. 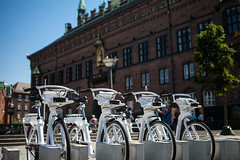 Copenhagen and Aarhus, Denmark’s two largest cities launched new public bike-share systems. On July 4th, the Minister of Transport in Denmark launched a new strategy aimed towards getting more people to use their bikes. 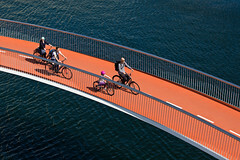 No more carrying your bicycle: Copenhagen opened a new 230 meters- long bicycle bridge and removed a missing link. Focus on cycling contains guidelines for the road projects in the city of Copenhagen. The purpose is to contribute to road projects in Copenhagen being designed so that bicycle traffic is considered as optimal as possible.